What is Oventus Airway Technology? Traditionally sleep apnea patients identified with nasal obstruction have not been considered to be a good candidate for oral appliances and are typically prescribed CPAP. This is because a natural reaction to not being able to breathe through your nose is to mouth breathe. If an oral device were prescribed, you would find it difficult to tolerate because both the nose and mouth would have a limited capacity to breathe. The O2Vent® airway channel has been incorporated into each device that enables unobstructed air to flow through the device to the back of the throat, bypassing common sites of obstruction such as the nose, tongue and soft palate. The O2Vent® Optima is our latest product in the O2Vent oral device range. The O2Vent® Optima is 3D printed with a durable nylon, and each device is customized to fit each unique individual. 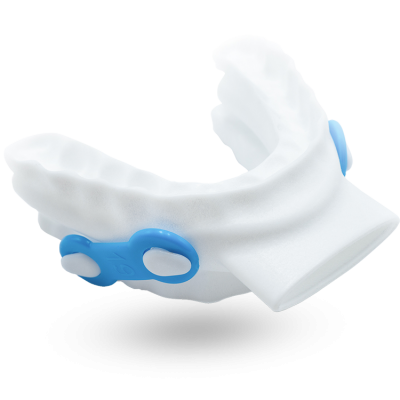 The O2Vent® Optima is a comfortable and discreet alternative to CPAP for the treatment of obstructive sleep apnea. A mechanism of advancing the jaw forward encouraging a more open airway. Incorporates an airway channel that further stabilizes the airway. Who will benefit from O2Vent® Optima? Anyone who snores or suffers mild to moderate sleep apnea. Anyone who suffers nasal congestion or a blocked nose and reverts to mouth breathing during sleep. Anyone that cannot tolerate CPAP or desires an alternative treatment.